‘Visceral’ will be a popular adjective in reviews of Alejandro González Iñárritu’s latest. It pretty much resets the dial on the description. We begin among a band of 19th century frontiersmen in uncharted America. When natives attack in the opening act it is with such stunningly realised ferocity we virtually feel every axe blow, reel from every muscle-puncturing arrow. We are caught in the ambush, witnessing and sharing the disorientating panic. It is one of the most impressive fight sequences ever committed to celluloid. It sets the tone early for Iñárritu’s follow up to the highly acclaimed Birdman (2014). The Revenant could not be a more different beast. 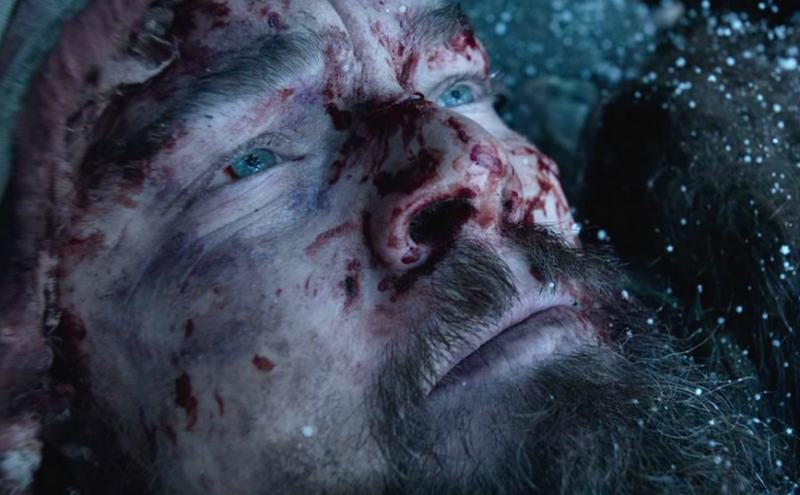 It follows the true legend of trapper Hugh Glass (Leonardo DiCaprio) who manages to escape with the precious few of his clan who flee by boat. When they continue their mission to return to the safety of their base on foot, Glass scouts ahead. Solitary and vulnerable, he disturbs a family of bears and is viciously mauled. Staggeringly, he lives. Just. Suffering horrific injury, rendered mute and immobile, his tribe are forced to continue with him borne on a stretcher. But such a fragile cargo only hampers their progress in already difficult terrain. So Glass and his son are left in the care of Fitzgerald (a grizzly Tom Hardy) and Bridger (a callow Will Poulter). They agree, for increased pay, to see him home, however long and difficult the journey. As long as he can survive it. The core trio at the heart of the story represents the cream of contemporary Hollywood. While DiCaprio’s role entails little dialogue, it is a performance of seemingly extreme endurance, garnering extensive publicity in the run-up to Oscars season. He certainly appears to suffer for his art. As does everyone battling the elemental torture of this most punishing winter. No one can do inherent menace quite like the aptly named Hardy. His performance is brutal, primeval. And as their Captain, Domnhall Gleeson combines the inured toughness of his breed with an intelligence that justifies his superior rank. The camera viewpoint is low, angled up at the cast, the trees, the heavens. We are down among the undergrowth, the elements. Rooted. Earthbound. Inhabiting the world at the mortal level, we are always close enough to see the physical toll it’s taking, the damage being done, every cut and blistered lip. The depiction of violence is vivid, authentic, and unprecedented. As CGI matures it sinks deeper into the fabric of film. Increasingly it is covert, integrated, subtle …and impossible to spot. The combat scenes of The Revenant exemplify the exhilaration that such a supreme blending of real and augmented makes possible. Never has the concurrent beauty and brutality of the natural world been captured so effectively on film. You are equally in awe at the majesty of the breathtaking spectacles nature creates, and at the exceptional savagery surviving within it demands. The Revenant is an exhausting watch, but an entirely invigorating one. Gruelling, primitive, instinctive, and intense. And a simple tale of human tenacity fuelled by the powerful motivator that is revenge. Occasionally, films come along that advance the art of film-making; that push the capabilities of current technology to chart new terrain. Like the hunter-gatherers of Glass’s tribe exploiting the spoils of newly captured territory, new ground has been conquered.